Many scientists could advance their careers if they could just get the hang of storytelling. Impact statements that describe how their research improves peoples’ lives could help researchers secure funding, find collaborators, and share their findings with wider audiences. Mattingly’s audience, a group of female scientists quickly rising in their fields, came together last month as part of the Rising Stars in Biomedical Engineering workshop held on Johns Hopkins University’s Homewood campus. 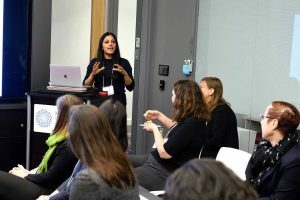 Funded by several Hopkins institutes and departments and held at the Kavli Neuroscience Discovery Institute, the workshop aimed to give women the skills they need to pursue faculty positions in biomedical engineering. While the number of women in labs and classrooms is growing, men still outnumber women when it comes to holding faculty positions in engineering disciplines. Johns Hopkins University and MIT are trying to change those statistics through programs such as the workshop, which was first held in 2016. It brings together a cohort of talented women graduate students and postdocs who represent the next generation of leadership in biomedical engineering research. Participants at this year’s workshop, nominated by faculty members at their respective institutes, came from organizations such as the NIH, MIT, Stanford University, Columbia University, the University of Washington, and UC Berkeley. Six came from Johns Hopkins: Chloe Audigier, Sarah Dougherty, Kate Fischl, Sarvenaz Sarabipour, Ayushi Sinha, and Sooyeon Yoo. Their research interests include computational cancer genomics, regenerative medicine, neuroimaging, minimally invasive surgery, 3-D printed brain models, and epidemiology and public health. “Rising Stars began in 2012 at MIT with the mission of providing critical career development training for women in electrical engineering,” said Sri Sarma, assistant professor of biomedical engineering and associate director of the Johns Hopkins Institute for Computational Medicine. Sarma co-organized the workshop along with MIT professors Polina Golland and Martha Gray. “We want these young rising stars to leave Hopkins empowered and excited to move onto the next phase of their careers,” she said.